A broken furnace is always a significant inconvenience. Not only do you lose your heating capabilities, but you could also be in for a high repair cost. 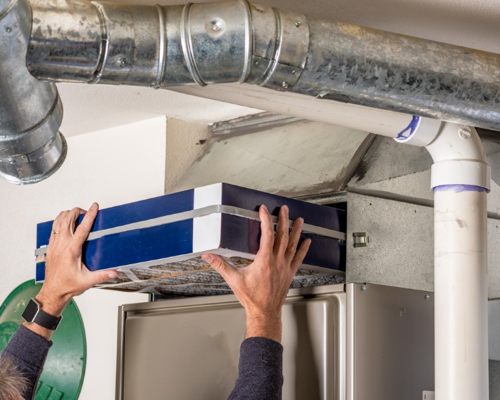 Luckily, you can protect yourself against both of these traps by understanding the elements of furnace repair costs and how you can avoid malfunctions altogether. We help you do so in the sections below. The vast majority of homeowners pay between $150 and $400 for furnace repair. In rare cases, that number extends from $50 to $1,000. Once you reach the upper end of that range, it is likely time to consider a new furnace over repairing your old one. This decision is best discussed with a professional. Before talking about the elements of cost, let’s discuss the common issues that furnaces run into. Improper Maintenance – The primary tasks that you need to carry out are following proper usage guidelines, changing the filter, cleaning ducts, and checking for leaks. If you do not prioritize these responsibilities, you are putting your furnace at risk. Filter – The most important factor of the three we presented above is changing your filter. If you don’t, you’ll raise your electricity bill, make your furnace work harder for the same results, and make its lifespan than it should be. General Wear and Tear – No matter what, every piece of machinery is going to degrade over time. Your furnace is no different. Proper maintenance can help, but age will take its toll no matter what. Dysfunctional Thermostat – Your issue could be unrelated to your furnace. Instead, it might be your thermostat. Luckily, repairs for this element of your heating system should be much less expensive than the more complicated machinery. The following three factors are the primary drivers of cost for Winnipeg furnace repairs. Warranty – You might find that your system is still under warranty when you start to have issues. This realization is significant, as it can lower or eliminate your repair costs. The best way to find out is by talking to the manufacturer. Damage – The second essential piece of information is the extent of your damage. Minor issues will have a low price tag, while others will be so expensive that buying a new system is cheaper than repairs. Service Provider – Lastly, different service providers have different pricing structures. One way to get a great deal is getting quotes from multiple companies before choosing which to go with. The two most important maintenance tasks you can carry out are changing filters and cleaning ducts. For the former, your best bet is switching your filter every month during periods of high usage, and every other when your usage is low. For the latter, you should vacuum the vents that feed into your home at regular intervals. You can also hire a professional to carry out a deep clean of your entire duct system, which comes with a variety of benefits. As we mentioned above, the company that you choose for your furnace maintenance will dictate how much you pay for the service. Another reason why they are important is that proper repairs lead to years without needing more work, while a shoddy job will quickly lead to another malfunction. Lastly, the best businesses will give you an accurate idea of whether or not you need a new system, rather than a repair. These two additional functions are further proof that choosing the right service provider is crucial. You can take two things from this article. First, adhere to the maintenance tips on this list so that your furnace stays functional for as long as possible. Next, you can utilize your knowledge of repair costs to choose an excellent service provider and get a great deal. Combining those two actions will save you a significant amount of time, money, and frustration going forward.